The No. 3A Panoram Kodak was the last in the series of Panoram Kodaks. It was manufactured by Eastman Kodak Company of Rochester, New York USA between 1926 and 1928. The two earlier model Panoram Kodaks were the No. 4, available between 1899 and 1924, and the No. 1, available from 1900 until 1926. Because of its short life-span the No. 3A is the most difficult of the three models to locate. The No. 3A Panoram takes panoramic views covering a 120 degree angle on size 122 roll film. The No. 3A image size of 3 1/4 x 10 3/8 inches is larger than that of the No. 1 at 2 1/4 x 7 inches, and smaller than the No. 4 image of 3 1/2 x 12 inches. The angle of view was also larger than the 112 degrees of the No. 1 and smaller than the 142 degrees of the No. 4. So in most respects, except birth order, the No. 3A was the middle child. Kodak Panoram cameras do not have a conventional shutter. Film is exposed as the lens swings in a 180 degree arc. 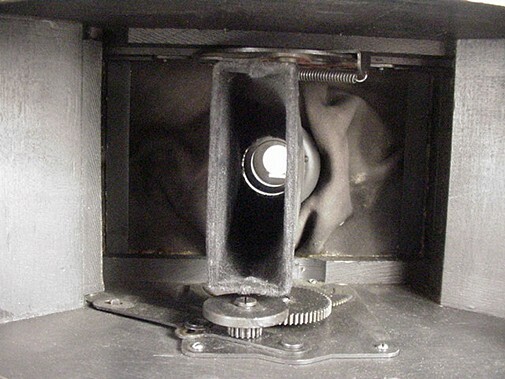 This view of the camera's interior shows the lens nearly mid-point in its travel. A rectangular shield projects a narrow strip of light across the film as the lens rotates. 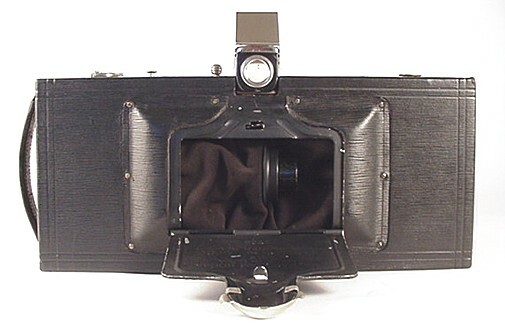 A soft leather covering is attached around the lens and connected to the camera body to shield extraneous light from the film chamber. This principle of operation applies to all Panoram Kodak models, with minor variation in mechanical design. Unlike the removable back of the No. 1 Panoram Kodak, the No. 3A back is hinged. 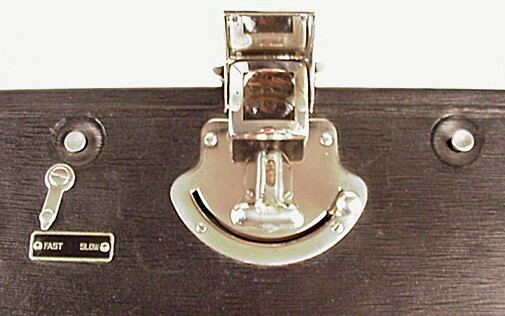 In addition, the camera sides are hinged and swing open to facilitate film loading. It is necessary to unhook the carrying strap from the camera top to open one of the side doors (not sure whether we should call this the left or right door). Notice the semi-circular section of wood in the back opening. This is the film plane. This radically curved film plane is common to all rotating-lens panoramic cameras. Camera operation was, typical of Kodak products, quite straightforward. A knob extends from a central semi-circular slot. To arm the shutter, the knob is pulled along the slot until it latches at the other end. There are two shutter releases. They are circular and appear to the left and right of the arming knob. To fire the shutter, push the release that is raised. For the next shot, move the arming knob in the opposite direction and press the opposite release button, now raised. The lens can be set to travel at one of two speeds - fast or slow. The lever seen behind the left shutter release is the speed control. Varying lens rotation speed has the same effect as varying a normal camera's shutter speed. Faster lens rotation produces a shorter exposure time. Also notice the waist-level brilliant viewfinder. Behind the viewfinder are two spirit-levels set 90 degrees apart. In this photo, only one of the levels is easily seen. The best panoramic photographs were achieved when the camera was held level in all directions. The No. 3A Panoram Kodak has a waist-level brilliant viewfinder. But in addition, a mirror is mounted inside the viewfinder cover, so the camera can be held at eyelevel as well. The shutter arming knob can be clearly seen in this view. 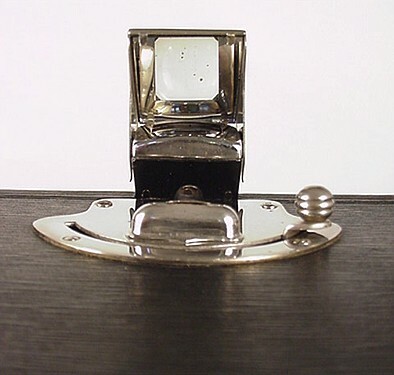 The raised hump of metal behind the viewfinder is the spirit-level housing. 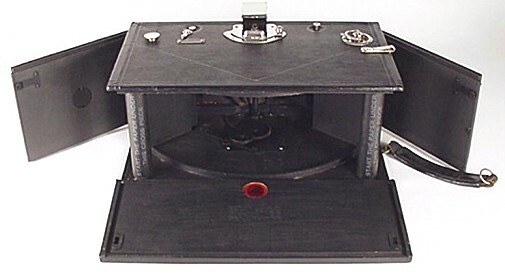 Typical of vintage roll film cameras, a red window was used to count exposures. The No. 3A Panoram took 3 or 5 exposures per roll, on size 122 film. 122 roll film was available in 4, 6 and 10 exposure lengths. I am not certain whether the 4 exposure roll had been discontinued prior to 1926. It makes sense that the 6 and 10 exposure rolls were best for the No. 3A Panoram, as they yielded one-half that number of panoramic photographs. I am surprised to see that the camera back label calls for Kodak A-122 roll film. The 1926 Kodak catalog also specifies A-122 film for the No. 3A Panoram. 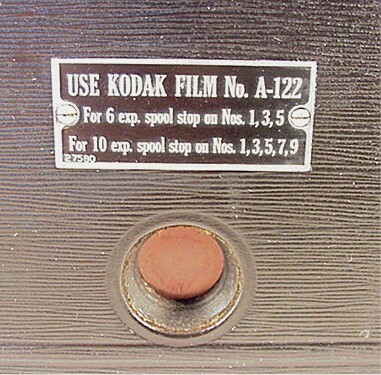 Kodak used an A prefix before a film number to distinguish autographic film from standard film. What I find odd, is the No. 3A Panoram does not have autographic capability, so why wouldn't Kodak specify standard 122 film instead? This view of the No. 3A Panoram Kodak shows the lens and viewfinder covers in their closed positions. The gizmo on the far left, near the carrying strap hook, is the film wind knob. Notice the angular lines formed in the leather on the camera's top surface. These are sighting lines, to be used by the photographer in judging the field of view. As primitive as they might seem, sighting lines can be effective, and appeared on a variety of Kodak cameras. Another example of sighting lines can be seen on the A Ordinary Kodak camera of 1891. 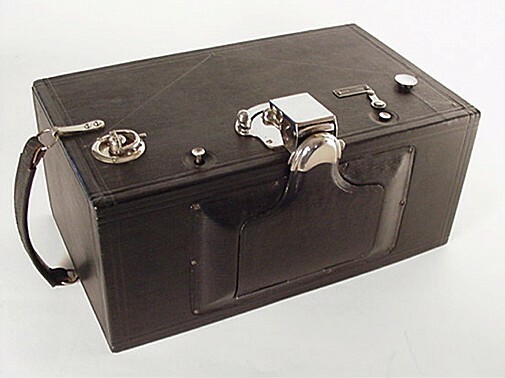 This wood-bodied camera is covered with leather that has a unique pebble when compared to other Eastman Kodak cameras. Kodak advertising called this unusual covering "long crepe grain genuine cowhide". To briefly summarize a few other details, the camera lens is a fixed-focus, fixed-aperture meniscus. The serial number of this example is 1700. The camera has tripod sockets for both horizontal and vertical photographs. Metal parts were finished in nickel and black enamel. The camera sold for 40 US dollars in 1926. If you would like to see a No. 1 Panoram Kodak, or Al-Vista Panoramic camera, follow this link to the Panoramic Format Camera page. I plan to add my No. 4 Panoram Kodak camera to this site in the near future. An Eastman Kodak panoramic camera patent is presented on the Patents page.